5 Cork Crafts For Adults! Fun cork crafts for adults: The next time you sit down with a relaxing glass of wine, take a closer look at the interesting labels, and especially, the variously designed corks. You may be having some of the last natural real corks in your wine collection - because, they are fast becoming relics, what with vineyards using more of inexpensive, artificial corks. So, cherish those real corks while they're around and make fun cork crafts like the ones below. One day, they may become collector's items. 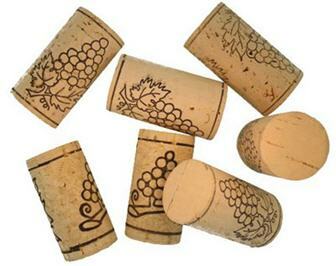 But meanwhile, use them for some great kitchen décor - with these super wine cork craft ideas. Put a generous amount of glue on the wreath. Fix a cork into place. Before the glue dries, turn the cork so that it reveals the name of the vineyard. Continue the process until the entire wreath is covered with corks. Glue the fake grapes onto the corks, where needed, without hiding the name. Try out some interesting patterns. Now, glue on the ribbon, greenery, etc. Tip: You can make fake grapes by cutting them out of foam and painting them green or red. Cut off a thin section from the side of a cork to get a thin, flat slice. Cut out a matching piece of self-adhesive magnet sheet. Remove backing and stick it on cork area. You can now use the cork magnets wherever you want. Turn your wine corks into smart drawer knobs. Drill a small hole through the cork. Fix it by using a thin bolt with a nut inside the drawer. Or use them as tea towel and mug hangers. Put together a row of corks, as above, onto a slim wooden base.Fix corks with base in a suitable place for use. Cork is an effective heat blocker - so it makes superb trivets and trays for hot pots and pans. Glue corks onto picture frame, in rows or any interesting pattern - and you've a great holder and a memorable centerpiece for your next party. Get a chalkboard with a flat frame. Place the corks next to each other on the frame. Fix firmly with glue. Use glue on the cork sides and the part that'll attach to the frame - so that the corks are fixed to each other and the frame. With pushpins or thumbtacks, affix stuff to the corks. This useful board will be just right for notes, reminders, coupons and other family stuff.